Home > Autogeek Rebel Auto Detailing Supply Cart - Revolution Model Free Ground Shipping! Autogeek Rebel Auto Detailing Supply Cart - Revolution Model Free Ground Shipping! For a limited time this item ships for FREE! That's a savings of $150! The ultimate in auto detailing carts! The Autogeek Rebel Auto Detailing Supply Cart is everything you’ve ever wanted in a detailing cart – and so much more. Manufactured using a heavy-duty all-steel construction and equipped with tons of convenient features (some you wouldn’t even think to want! ), the Autogeek Rebel Auto Detailing Supply Cart could be the answer to years of clutter, disorganization, and over-all disorder in your detail shop or home garage. Additional optional features can make the Autogeek Rebel Auto Detailing Supply Cart a huge money and time saving investment. To be one of the best, you need to have the best, and the Autogeek Rebel Auto Detailing Supply Cart is a step in the right direction. There’s one thing all detailers, be they enthusiasts or professionals, have in common: the need for more space. You don’t even realize how much space all of your stuff takes up until there’s no more space to be had! And say you do have a cabinet or overhead storage in your shop, how do you get all of your supplies where you need them? That sounds like a lot of back and forth carrying that can be avoided with a quality detailing cart – the Autogeek Rebel Auto Detailing Supply Cart. Reminiscent of your favorite tool box, the Autogeek Rebel Auto Detailing Supply Cart’s top lid lifts up using hydraulic components for a gentle lock and release system. Once the lid is fully open, you will not have to worry about it slamming shut. This top compartment measures about 9 inches, perfect for storing small bottles of product, polishing pads, towels, or any other small detailing supply. Also featuring a cutout for power cords, the top compartment can be the perfect place for a small table top fan, or laptop while working. Right below the top compartment is a pull out drawer that can be used for storing detailing brushes, small tools, pens or other office supplies, or even a keyboard if you’d like your Autogeek Rebel Auto Detailing Supply Cart to double as your home office desk! 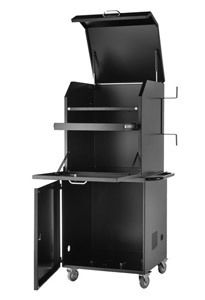 The next compartment down features a pull down door that can double as a desk top or working tray. The larger interior space of this compartment can store a ton of microfiber towels, a couple of your favorite go-to polishers, and your larger detailing product bottles. Measuring about 13” x 24” x 24”, this middle compartment is the second largest and the closest to your reach. Added bonus – the pull down door has a lip which prevents small tools from sliding off AND doubles as a surface to hang spray bottles while open! Before we get into the bottom compartment, there’s yet another feature unique to the Autogeek Rebel Auto Detailing Supply Cart. It was designed with two heavily used detailing machines in mind – a California Air Tools Air Compressor and a Metro Vac N’ Blo Portable Vacuum. Equipped with mounting brackets made just for these specific machines, they can be anchored in and you can be on your way to a fully detailed car! *Autogeek Rebel Revolution Edition pictured here. 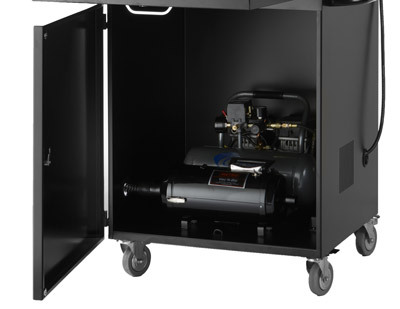 Aside from the customized space for your air compressor and vacuum/blower, the bottom compartment features an industrial grade power strip and 15 foot cord that anchors to the base of the cart. This power strip has 6 outlets to accommodate all of your power tools and anything else you may need to plug in or charge while in use. 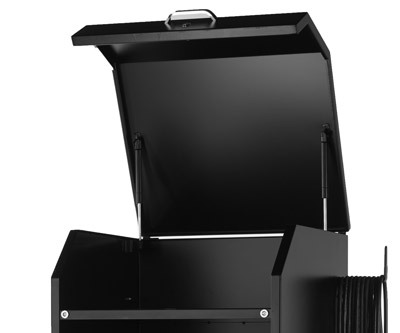 If you already have store for your air compressor and vacuum/blower, use this bottom compartment to store empty buckets, your Detailer’s Rolling Creeper, or extra product! And hey, with this bottom compartment measuring 28” x 25.75” x 29”, you may even be able to fit a mini-fridge for cold drinks in there! Each Autogeek Rebel Auto Detailing Supply Cart features exterior handles for easy maneuverability and additional storage for hanging spray bottles. 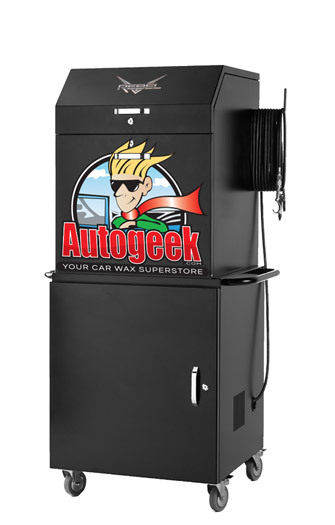 With a black powder coated exterior, exclusive Autogeek logo featured on both configurations, and chrome finished door handles, the Autogeek Rebel Auto Detailing Supply Cart also adds some décor to your detailing space! Included in the Autogeek Rebel Revolution Detail Cart model. These items are drop shipped from the manufacturer and are oversized packages. A $150 shipping fee applies to these products. International and expedited shipping is not available. Additional discounts are not applicable on these items. Autogeek Rebel Auto Detailing Supply Carts are non-returnable.